My maid in Singapore used to always offer to make sardines for me because she knew I loved to eat milk fish but was too lazy to remove the bones. She told me by pressure cooking milk fish just like sardines, I wouldn't have to bother removing the bones. The pressure cooker would soften the bones to a point where you could eat it. 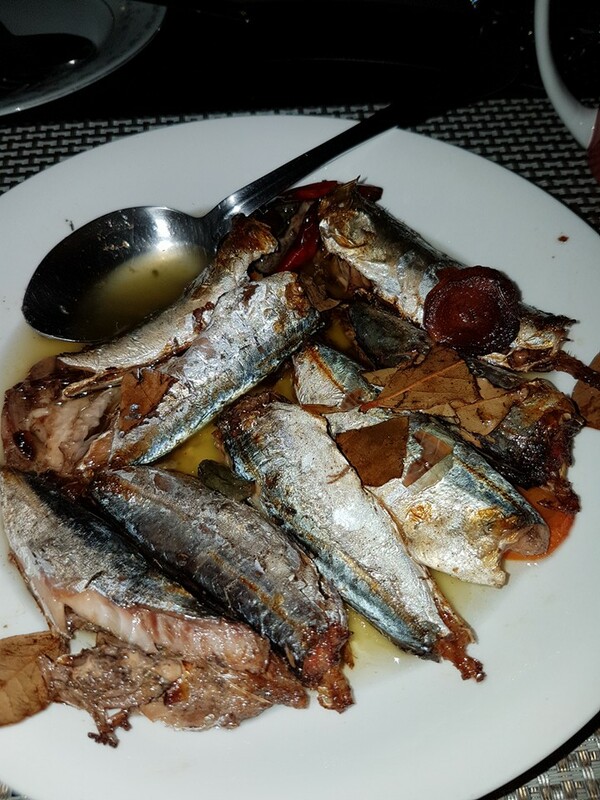 My girlfriend and I enjoy eating at Barcino and they sell these canned sardines that have larger than the usual sardines. Something you couldn't find in any super market. This inspired me to make my own because I wanted to have bigger fish for my sardines. 1 Kilo Round Scad Fish. About 10 pieces to a kilo. Clean the fish. Cut of the head and tail with scissors and remove the gills and innards. Season with salt and pepper. Lay seasoned fish into the pressure cooker. Put the whole pepper corns, bay leaf, cut carrots, pickled cucumber, red chili. Pour the olive oil and make sure there is enough to cover the fish and all other ingredients. Put on the pressure cooker in the stove and 100% flame. As soon as the pressure cooker starts to make the sound. Lower the flame to 50% and let it cook for another 35 minutes. That's it. Serve with garlic bread and you're good to go. I used to live just a few blocks away from a Bak Kut Teh place along Balestier St. It was famous for night walkers and food shops, very similar to Geylang but not as crowded. There was this food joint I would always drive past but never stop, not because I didn't want to, but rather, I could never get a spot near by to park. It would usually be my last stop before heading home after an evening enjoying the good spirit. Nice bowl of soup always was a good way to calm the stomach to sleep. Tried it the first time several years ago when my Singaporean boss introduced it to me. We had it for breakfast before a game of golf and that began my love for it. I've had Bak kut teh in Changi, Bak kut teh at mall food courts. I like it, had an idea of what was good about it, but I still didn't get the taste I craved for until I finally found a place to park near Founder's restaurant. I tried the pork rib first and eventually moved on to the pig kidneys, pig intestine and my favorite, pig tail. Next thing you know, I started walking the 10min distance from my apartment to it. Got the idea from Makasuntra raw which I saw at the net and tried it myself. 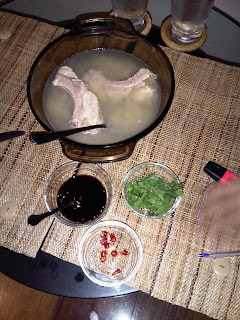 Just could do the pork rib as the other more interesting parts are more difficult to do. 1 kilo prime pork ribs. Par boil the pork ribs to remove the scum and other unwanted oils. Remove water and set aside. Prepare a pot big enough for the ribs with water to cover. Crush the garlic with skin, not to hard, but just enough to expose the inside and put into pot. Add the white pepper. Turn on stove to high and allow to boil. Once boiling put the ribs. Allow to simmer. Remove scum from water from time to time. This should take about an hour or until pork ribs are almost fork tender. Put kinchay leaves before serving. Side sauce to your desire, dark soy sauce, birds eye chili or thai chili. This is perfect with You Tiao but still figuring out how to do that. Had this with rice for now. I like my eggs almost raw for the yolk. Learned this from Jose' from AFC. Love it. Step 1 - Separate the yolk from the egg whites. 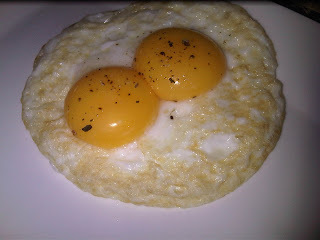 Step 2 - Fry the egg whites on both sides till slightly brown. Step 3 - Remove the fried egg whites from the pan and place the yolk. * If you want the yolk slightly cooked, place the yolk right after turning the egg whites to fry the other side. Was watching Anthony Bourdain on youtube and I stumble on the No Reservations Chile episode. Anthony walks into a carinderia turo turo restaurant in Santiago City if I am not mistaken. As usual his guest host was bringing him to the restaurants which well represented the food of the country. And so they bring out the Caldo de Pata. Cow hoofs in its on broth. It looked so good on the little screen, glistening soup with the litid of the cow hoofs pretty much the majority of the bowl. They were eating it with such gusto that I just had to have a try. Got this recipe of the net. 1 kilo ox feet or ox pata(you can usually get this on the frozen section of the meat department of your local supermarket). 1/2 kilo carrots sliced like a sausage. Any vegetable you would like to add. I used cut cabbage, about a cup. Boil the ox feet in water for about 10 minutes to remove the scum. Make sure to clean well before and after boiling. Add half of the carrots, celery root, and onions. Boil in a simmer for about 3 to 4 hours until tender. I used a pressure cooker so it only took me about an hour. The good thing about slow cooking though is that it allows you to clean out any further scum which boils out. In a pressure cooker, you will have to do this only after the boiling process. Remove as much of the celery, onion and carrot from the remaining broth. Then return the remaining portion of the uncooked carrot. Cook for about 10 minutes. Add salt and pepper to taste. Then I added the cut cabbage to the broth for another minute. When serving. Sprinkle with some lime. Cut up the celery leaves and also put on the broth. Really great with rice. Serve some sili on the side to make spicy. It was an event full evening for my brother and his family as a powerful typhoon had passed by and power was lost in majority of the city. I was home for the weekend in Manila as I was still based in Singapore during that period of my life and my brother and his family stayed at my house as I was lucky enough to have power immediately after the storm passed. That time I was experimenting making black paella (Paella Negra). He enjoyed it so much that he bought a paellero for my birthday and some special paella rice on another year. Ingredients (This all depends on the size of your paellero, mine is about good enough for 6 people. Boil 6 cups water and put 2 shrimp cubes to create a shrimp stock. Once the the cubes have been dissolved and boiled for about 5 minutes. Set aside as we will use this for the paella later in the process. Very important when cooking paella is to ensure enough heat on all sides of the paellero. Since I my brother has yet to buy me a paellero burner, I used a charcoal grill. One advantage to doing this is the great improvement in taste when cooking over wood or charcoal. I put enough coals to last about 30 mins. Put the paellero when the coals have all been lit. This will give you enough heat around the paellero to start cooking. Make sure all ingredients are ready when you begin. Put the olive oil. It will only take a few seconds to heat up. Put the prawns and saute in the olive oil until red and almost cooked. Set aside. Saute the bell pepper next for about 2 minutes and set aside. Add olive oil to the pan if needed. Saute the garlic for about 30 seconds then put the squid for about another 5 minutes. Then put the pimenton, garlic, onions and tomatoes. Continue stirring for about 5 minutes as the tomatoes turn soft. Put the rice and stir for about 5 minutes to allow the sauce to coat the rice completely. By this time the coal should be about low enough to just simmer the rice. Then put the shrimp stock. Put the saffron and ink sacs and stir to mix the ingredients completely. Cover the paellero with aluminum foil enough to cover completely and allow to boil for about 8 minutes. Uncover after and put the strips of bell pepper and prawns above the rice. Cover again with the foil and allow for the rice to cook completely maybe another 5 mins. Some prefer with about 2 tablespoons of aioli over the completed pealla for the additional olive oil and garlic taste. I prefer this one just as it is. Once in a while you want to eat something for a change. Adobo is a weekly meal for me but you can get sick of it. So here's my version of adobong manok sa gata. 1 pc Thai chilli or siling labuyo chopped (if you want it spicy). When chicken is brown, put the vinegar and cover pan. Simmer for around 5 mins to allow the vinegar to evaporate slightly. Then put the coconut cream. Don't put too much to cover the chicken. Put the pimenton, fish sauce, whole pepper and laurel leaves and cover pan. Allow to simmer until the chicken is cooked. When cooked put the finger chilli and sili leaves and cover for about a minute and that's it. In these photo, I used red thai finger chillies chopped instead of the whole finger chilli. I wanted an even spicier version. My mom always made the best callos as far as I know. She put a lot of love into it and this could seen by the way her family and friends enjoyed the dish. I quickly learned the dish when I started my own family as she limited cooking callos only during Christmas and a few special occasions. When I was separated from my wife, I also quickly learned that women do actually enjoy this dish. Its a nice dish to start and end the evening. Serve with a baguette or some garlic rice. So here's my recipe, hope it works for you too. Before everything else, get started by simmering the ox tripe and ox feet with enough water to cover. Put the beef bouillon cube in the pot along with some bay leaf. This will take a few hours if you don't have a pressure cooker. Once the ox parts are tender, set aside and keep the broth. Cut the chorizo Bilbao (please not chinese chorizo or any cheap chorizo, the worse you can do is use one of those canned local variety) and fry until the oil from the chorizo comes out. (The secret to any good callos is the chorizo). Set aside the chorizo. Put the olive oil and garlic. When the garlic is slightly brown, put the tomatoes, onion and bell peppers. When those have softened, put the pimenton, cumin, thyme , rosemary, ox parts and chorizo into the pot. Mix all the ingredients well in the pot. Pour the red wine (preferably a rioja or a tempranillo). Simmer a bit till the alcohol evaporates. Put the tomato paste and just enough beef broth. Put the canned garbanzos. Add salt and pepper to taste and simmer some more until you get the consistency you prefer. More or less to the thickness you desire. Garnish with some parsley. And there you have it! Callos.